March may be the month of many weathers and we in St Anne’s have embraced the sun and the rain of the past weeks and certainly welcome the spring weather this week. It has been the month of many events here too. Central to March is of course our celebration of Seachtain na Gaeilge. Bhí alán eachtraí ar siúl anseo – Céilí Mór, Lá Glas agus na daltái ag labhairt Gaeilge ar fud na scoile (Ticéidí glasa/Frása an Lae). The Banna Ceoil ‘Cairde trí Cheol’ made their debut at assembly entertaining everyone with three lovely pieces- Comhghairdeas do gach duine!. The children in senior classes were involved in the Tráth na gCeist and Cluiche Cor- learning games through Irish. They also supported younger classes with Lón as Gaeilge and Movie as Gaeilge . Bhain gach duine taitneamh as an tseachtain! We are currently updating our planning for Gaeilge Comhrá and hope to be in touch with parents soon to show ways of supporting the language development at home. March also was the month when we held that Book Fair at St Anne’s. Many thanks to all parents who supported the purchasing of books (we took in over €4000 which gives the school a great commission from which we will but further resources for the school). Thanks to parents in the PSG who gave so generously of their time to man the desks at the fair. We appreciate the support so much! Many other activities took place during Book Week, Congratulations to everyone on their costumes on a book theme- some really creative work was evident in the costumes. Thanks also to the senior classes who created Library Treasure Hunts for the juniors and well done to all classes who provided art work and written work during the week. I am especially looking forward to reading the books that 2nd class created for the Write a Book project- well done all! I am always delighted when children come to me with new ideas for events and competitions here. Thanks to you all – I know you will be entrepreneurs of the future! We have ‘Go Music’ clubs and Dance events going on, art competitions and writing competitions and of course our Wednesday clubs continue each week. The Lego club continues on Tuesdays and Chess takes place on Wednesdays. 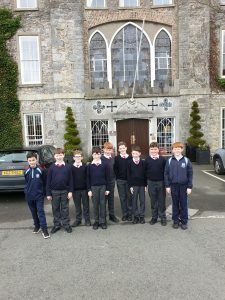 I was very proud of our senior chess players who travelled to Clongowes College last week for a chess event. Thank you for representing the school so well. Ms Malone is continuing with lego club after school for junior classes-some amazing structures are being created there! The PSG have been busy this month too. Well done to all the committee and parents who supported the movie nights (final one this Friday for 5th and 6th). Thanks to you also for the recent talk on wellbeing which certainly gave us all food for thought. On Monday April 8th we will be holding a talk for parents on Internet Safety. We have invited a company, Zeeko, to work with children during the day and to present to you the parents later that evening. We hope that as many of you as possible will attend. The Basketball blitz continues at lunchtimes on various days- well done to all taking part in that and thanks to Mr O Leary for co-ordinating the blitz. Our badminton team, under the guidance of Mrs Knightly, played really well at the recent competition in Dublin- well done all. Lots of other sports events will be coming on stream shortly and other school initiatives such as Green Schools and linking with the local communityetc. We were delighted to receive a very generous donation of a buddy bench from the Anca Muresan fund. 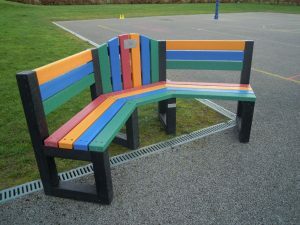 The bench is now situated in a central part of the yard and is used by children to rest and to link with friends. The inscription on the bench is in remembrance of Anca, mother of Raul and Daria and dear friend of St Anne’s. Thanks to all who made this possible-know that children will use this for many years to come. Paired Reading starts for Senior Infants this week- thanks to all our parent volunteers. More to follow on all of these!